Thre are two international coalitions fighting against terrorist organisations in Syria and Iraq. One of them consists of Russia, Turkey and Iran, and the other one is made of a variety of actors under the leadership of the United States. Technically, the two coalitions pursue at least one common goal: the destruction of the Islamic State terrorist organisation (banned in Russia). Like Russia, the USA considers the destruction of the terrorist organisation its first priority goal in Syria and Iraq, and Donald Trump outlined this goal clearly in the very beginning of his presidency. Prior to Trump’s arrival in the White House, Washington’s position was somewhat different: his predecessor, Barack Obama, insisted on the removal of legitimate Syrian President Bashar Assad, whereas the destruction of the Islamic State was a second priority goal for him. When Trump announced the change of priorities in Syria, many hoped for a possibility to establish practical cooperation between the Russian Federation and the United States. In reality, it turned out differently. Washington was extremely reluctant to communicate with the Russian military. Coordination or joint actions were out of the question, but there were no attempts of direct opposition either. The exception was the cruise missile strike on Shayrat, but it was more likely aimed at the Syrian army and Assad. It did not show a significant negative impact on the actions of the Russian military. The consequent warning and the deployment of new air defence systems proved to be enough for the Americans to abandon their ill-considered actions. Presently, against the backdrop of the apparent success of joint operations conducted by Syrian and Russian forces against terrorists, a question arises again: is the USA going to help or hinder Russia and Syria in the destruction of ISIL? The question is not idle. It arose first in connection with the death of Russian General Valery Asapov in Syria. The attack was too precise and too timely; the terrorists would not have been able to do it without assistance from the outside. At the same time, the Russian Ministry of Defence drew attention to the suspiciously close and peaceful neighbourhood of US servicemen and terrorists on the Syrian territory. The Americans declined to comment on the matter, but they launched a thesis about the allegedly unfolding “race” for the right to inflict the last fatal blow on ISIL. The trophy is the right to gain control over the strategically important Syrian-Iraqi border, which is about to fall into the hands of the United States and its clients from the “moderate” Syrian opposition. The Americans claim that Moscow and Damascus make one mistake after another out of indignation, which is obviously nonsense. As for “mistakes,” a number of questions arises: why do terrorists manage to arrange counterattacks? How do they get together all the necessary forces and means, including weapons and ammunition, transportation, as well as intelligence? Why do these counter-attacks come from the areas of the deployment of American military and pro-American forces? Without waiting for any clear answers from Washington, the Russian side decided to strike a decisive blow on Jabhat an Nusra terrorist group (banned in Russia), which is responsible for the death of General Asapov. At the same time, military operations against terrorists were intensified in the east of Syria. If the Americans want to take Raqqa and announce their triumph for the world – let them come and do it. However, the Americans are not taking any measures. On the contrary, the USA has cut activities of its Air Force in the area. The Russian Defence Ministry demanded clarifications from the USA to find out America’s real goals in Syria. Is the destruction of ISIL and other terrorist groups still remains priority number one for Washington or does the USA want to stop Assad’s troops from winning the war with Russia’s support? 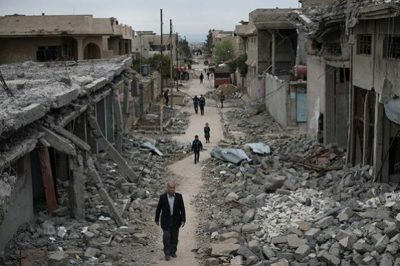 Does the USA support the restoration of Syria’s territorial integrity? Indeed, what is the USA doing in Syria? The question remains.